Cooking with toddlers in the kitchen is a great activity to keep them entertained but it will teach life skills and form healthy lifestyle and eating habits from an early age. No bake bliss balls are easy to make and can be stored in the fridge. They can be added to lunch boxes or eaten as a treat. I adapt the recipe depending on what is in the cupboard on a particular day. 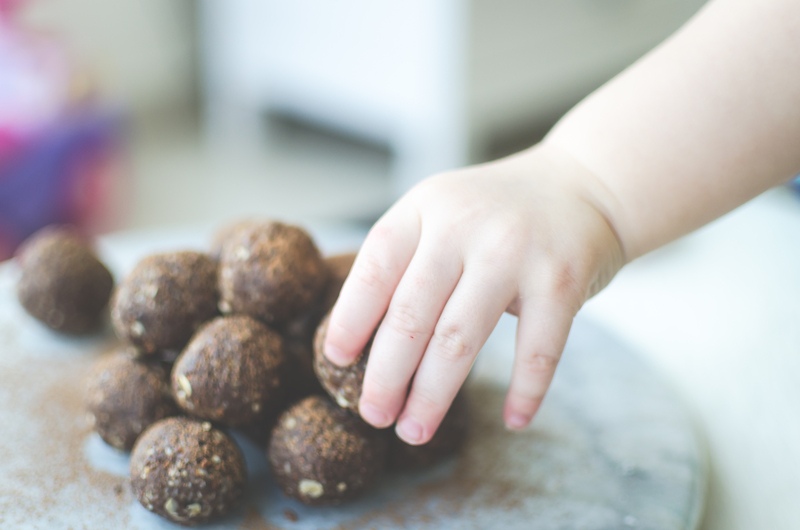 I roll these bliss balls into smaller sizes so they can fit in the toddlers hand and are easy to eat. Pop all dry ingredients into the food processor. Gradually add water until the mixture bind together like a paste. Sprinkle or roll the bliss balls in unsweetened desiccated coconut or cacao powder or chopped nuts.